It happens to all of us when we want to see the full size profile picture of a person who is not in our friend list. We can see full size picture by clicking on the profile picture. But this works only if the profile picture is added as public. If the person has applied privacy options, no one other than friends will be able to see the full size profile picture. Sometimes we came on few profiles that has attractive profile picture (Yeah, profile of girls) but we cannot see it in full size. I have a nice trick that will allow you to see the profile picture in full size even if the person has applied privacy options. Note: I am explaining this trick with my profile. It works on all profile. I will explain the reason after explaining the trick. 1. Open your Facebook account. 2. Now go to visit the timeline of any profile. 3. Right click on the profile pic and open image in new tab. 6. You will be able to see the full size profile picture of the person. 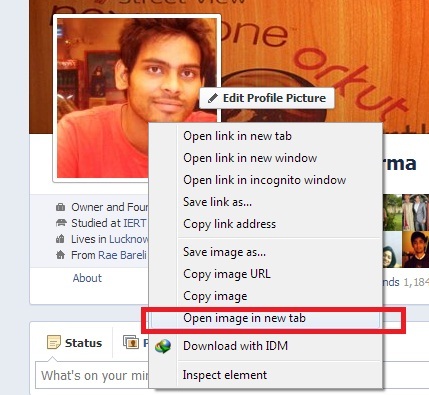 Now enjoy full size profile picture of any person. 2. Visit your profile and open your profile picture in full size. 4. Now, Visit the person’s profile whose picture you want to see in big size. 6. Now replace the number part in the full size photo URL of your profile picture with this number. Enjoy full size profile picture. Reason is simple. In the above two tricks, we used original URL of the profile pictures which fetches picture direct from the server. So, there will be no scripting restriction on the photo. In case of any confusion, you can comment below.